Australian Dollar jumps broadly today after RBA rate decision. While growth and inflation forecasts are downgraded, the overall announcement suggests that RBA is maintaining tightening bias. The next move on interest rate is still a hike even though it may take longer to happen. The positive impact of RBA is more than enough to offset rather poor economic data from Australia. Strength in the Aussie takes New Zealand Dollar up too. The currency markets are rather mixed elsewhere though, as part of Asia is on lunar new year holiday. Mild risk appetite keeps Yen and Swiss Franc weak but there is no follow through selling yet. Dollar’s rebound attempt fades ahead of near term resistance against Euro, Sterling, Australian and Canadian. But at the same, no particular strength is seen in others. The markets are generally waiting for fresh inspirations. Technically, with today’s rebound in Aussie, AUD/USD is now looking at 0.7295 resistance and break will resume recent rebound from 0.6722 flash crash low. EUR/AUD is also looking at 1.5721 and break will resume fall from 1.6765 high. EUR/USD is approaching 1.1407 minor support while GBP/USD is close to 1.3012. Break of these levels will solidify the case for Dollar rebound. But as long as these supports hold, more downside remains in favor in Dollar. In other markets, Nikkei closed down -0.19% at 20844.45. Japan 10-year JGB yield is down -0.0032 at -0.015, staying negative. China, Hong Kong and Singapore are on lunar new year holiday. Overnight, DOW rose 0.7%. S&P 500 rose 0.68%. NASDAQ rose 1.15%. 10 year yield rose 0.033 to 2.724, back above 2.7 handle. However, in a speech “Perspectives on the Economic Outlook and Monetary Policy in the Coming Year“, Mester said interest rate is already “at the lower end” of the longer-run neutral rate. It’s at a level that neither stimulates nor restricts the economy, and recent rate hikes are still working themselves through the economy. In the coming meetings, Fed will also finalize the plan for ending the balance-sheet runoff and completing balance-sheet normalization. Australian AiG performance of services dropped sharply from 52.1 to 44.3 in January. Retail sales dropped -0.4% mom in December versus expectation of 0.0%. Trade surplus widened to AUD 3.68B in December versus expectation of AUD 2.25B. UK BRC retail sales monitor rose 2.1% yoy in January. Looking ahead, Eurozone PMI services final and retail sales will be released in European session. UK will also release PMI services. Later in the day, US will release ISM non-manufacturing. 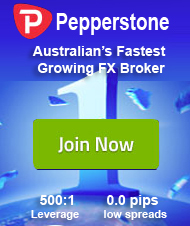 AUD/USD rebounds strongly today but stays below 0.7295 temporary top. Intraday bias remains neutral first and outlook is unchanged. Another rise could be seen with 0.7180 minor support intact. On the upside, above 0.7295 will target 0.7393 cluster resistance (61.8% projection of 0.6722 to 0.7235 from 0.7076 at 0.7393). We’d expect strong resistance from there to limit upside to complete the rebound from 0.6722. On the downside, break of 0.7180 minor support will turn bias back to the downside for 0.7076 support. 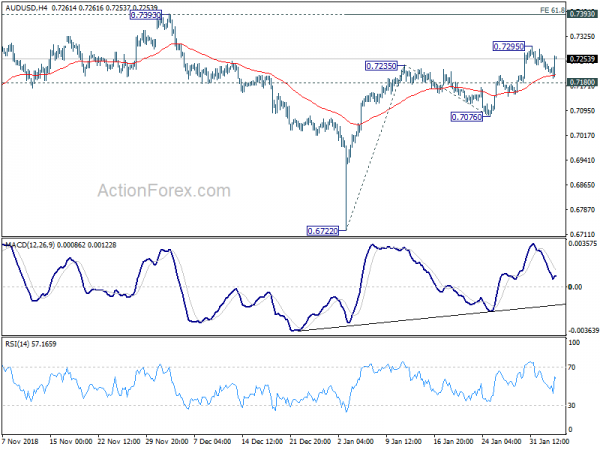 However, sustained break of 0.7393 will indicate bullish reversal and target 100% projection at 0.7589 next.